Here is Yoshi's legendary tear drop style pendant, and literally nobody in the world does it better. So clean and tight, you'll think your eyes are messing with you. 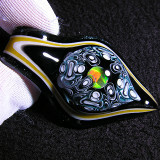 Amazing pendant with awesome dot stacking and a brilliant opal! Signed 'YK 14'. Hey man I'm talking to the current owner about buying this and was wondering if you know what color the yellow is? Would be much appreciated!